Unfinished gems and hewn metals reflect the intrinsic majesty of Nature’s treasures and the purity of great love. In the Anouk Wedding collection, the uncommon partners of delicate artistry and raw elements marry. Each unique wedding, engagement and anniversary band is infused with the character of its wearer and its mate’s. These custom rings tell a deeply personal love story. One rich in their secret symbols. 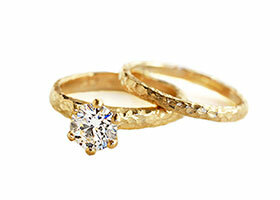 A story told by lovers – during your personal consultation – and translated by Anat, etched in gold or platinum. Anouk designs are not just exquisitely beautiful pieces of jewelry, they are art objects invested with meaning, cherished by those who appreciate things done differently. Tell us what you’re imagining for your special ring.